l Determine if a magazine is present. l Ensure the rifle is on safe. l Conduct a chamber check. i Bring the left hand back against the magazine well. i Extend the fingers of the left hand and cover the ejection port (see fig. 3-1). Figure 3-1. Position of Hand. Grasp the charging handle with the index and middle fingers of the right hand. 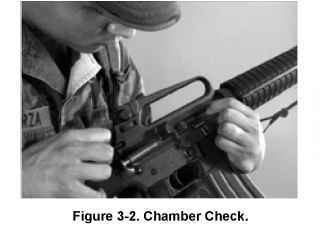 Pull the charging handle slightly to the rear and visually and physically inspect the chamber (see fig. 3-2). 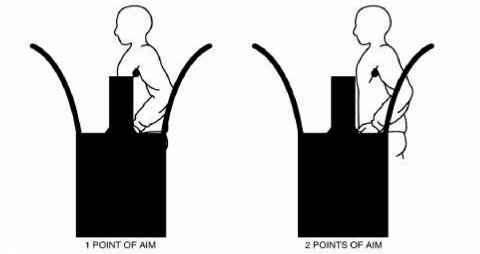 Right-handed Marines, insert one finger of the left hand into the ejection port and feel whether a round is present. Left-handed Marines, insert the thumb of the right hand into the ejection port and feel whether a round is present. The same procedure is used in daylight as during low visibility. A chamber check may be conducted at any time. Pulling the charging handle too far to the rear while inspecting the chamber may cause double feed or ejection of one round of ammunition. Release the charging handle and observe the bolt going forward. Tap the forward assist. Close the ejection port cover (if time and the situation permit). Remove the magazine (if present) and observe if ammunition is present. If time permits, count the rounds. Reinsert the magazine into magazine well.